It's jam-packed. It's got enough ideas, characters and plot for twice as many episodes. (It's adapting the manga's first 90 chapters or so, taking it to vol.11 of 28. That's nearly one manga volume per episode, which is a lot.) What's more, this is a story with a mental premise and a knack for going to town on it, involving witches, telepathy, body-swaps, stealing other people's powers, magical charm, invisibility, memory-wiping, precognition, changing the future, getting visions of the past and kissing. What don't they do? Ummm... time travel. (That would have made my head explode.) 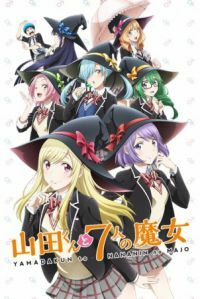 There are also seven witches (d'oh), one hero (Yamada-kun) and several more important supporting characters who might be powerful in the school hierarchy, knowledgeable about surprising things and/or a witch's lieutenant, partner or friend. So... yeah, there's a lot here. It's fun. It's ingenious and entertaining. However I think I'd have liked to see it given more episodes, while towards the end I thought there were a couple of potentially poignant moments that fell slightly flat. They're fine. They don't break anything. However they felt a bit throwaway and if I'd been the original author, I'd have been disappointed that they hadn't resonated more. It's still a good show, though. I'd recommend it. It's a genre-aware show, uninterested in reinventing the wheel and instead being keen to stretch its ideas in detail. What would happen if a group of friends started deliberately playing around with body-swapping? That's a comedy scene at the end of ep.2. After a while the show even starts skipping preliminary story stages, e.g. jumping past the job of finding the next witch and instead opening with our heroes already knowing their target's name and sometimes also even their powers. Admittedly it takes the show a few episodes to admit (despite the title) that there are other witches and powers beyond Shiraishi and the body-swapping, but even those early episodes are still pretty packed. This show genuinely surprised me a few times. It's so busy and inventive that you won't be able to guess much in advance, no matter how familiar you are with how these things usually pan out. Does it ever slip up? Does it have any stupid moments? Well, there's a bit in ep.5 where Yamada is pointlessly hiding something from Shiraishi. This is particularly senseless because she's more intelligent than him and might well be able to solve his problem, but fortunately he soon sees the light and tells all. (From that point on, what's more, he makes a point of not keeping secrets and instead tries to tell his friends as much as he can, as soon as possible. I approved.) Also, in ep.6, it takes our heroes forever to realise that a new witch's power is the one they'd seen written in a book about their school's witches at the end of ep.5. There's also a live-action TV show (eight episodes) from 2013, plus two OVAs that I must go looking for. One of them's a crossover with the author's previous manga series, Flunk Punk Rumble. This is a clever show. It's funny, but it's taking its characters and their problems seriously. My only niggle, I think, is that I think it's got too many elements and ideas for the show to do justice to in twelve episodes... and that's quite a flattering problem to have. It's better than the opposite, at least. Seven witches is a lot. They all get at least a spotlight episode, but that's the kind of cast you'd create to support a much bigger and more long-running series than this. I'm not so keen on the memory-rewriting in the last few episodes, but that's because I'm not keen on memory-rewriting stories in general and at least the show shares my opinion. The show thinks amnesia is bad. Our heroes agree and will be trying to prevent or undo it. It's good. Not flawless, but clever and lots of fun. It's not quite strong enough to make me go looking for the manga, but it does make me wonder about how this story played out in its original, longer format.